In this mix of personal memoir, criticism, and journalism, Hyden stands witness as classic rock reaches the precipice. Traveling to the eclectic places where geriatric rockers are still making music, he talks to the artists and fans who have aged with them, explores the ways that classic rock has changed the culture, investigates the rise and fall of classic rock radio, and turns to live bootlegs, tell-all rock biographies, and even the liner notes of rock's greatest masterpieces to tell the story of what this music meant, and how it will be remembered, for fans like himself. 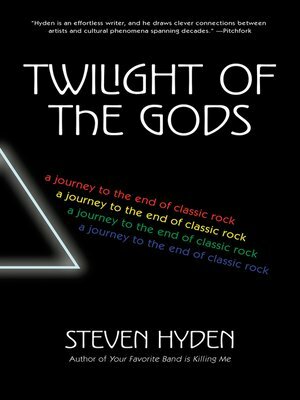 Twilight of the Gods is also Hyden's story. Celebrating his love of this incredible music that has taken him from adolescence to fatherhood, he ponders two essential questions: Is it time to give up on his childhood heroes, or can this music teach him about growing old with his hopes and dreams intact? And what can we all learn from rock gods and their music—are they ephemeral or eternal?